GarageBand turns your iPad, iPhone, and iPod touch into a collection of Touch Instruments and a full-featured recording studio — so you can make music anywhere you go. Use Multi-Touch gestures to play pianos, organs, guitars, drums, and basses. They sound and play like their counterparts, but let you do things you could never do on a real instrument. Enjoy a range of Smart Instruments that make you sound like a pro — even if you’ve never played a note before. 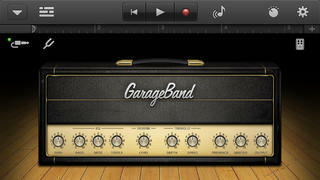 Plug an electric guitar into your iPad, iPhone, or iPod touch and play through classic amps and stompbox effects. Gather your friends to play and record like a real band with Jam Session. * Use the built-in microphone or a guitar to record or capture any performance. Then mix up to eight tracks to create a song you can share in email or send directly to Facebook, YouTube and SoundCloud. * Jam Session and iCloud are available on iPhone 4 or later, 4th generation iPod touch, and all iPad models.